Rwanda has partially launched a new forensic lab complex that will cut down costs of conducting forensic DNA tests. Rwanda has been spending millions in sending DNA samples to Belgium with each costing between Rwf300, 000 to Rwf600,000 and at least more than 800 samples are sent annually. The new laboratory (worth Rwf6billion) located in Kacyiru will replace the old Kigali Forensic Lab (KFL) which was since 2015 run by the Rwanda National Police (RNP) and prosecution providing three services- forensic toxicology and blood alcohol, drug and chemistry, and questioned documents examination and fingerprint analysis. However, with a new structure and the finest equipment, the new laboratory has 52 staff from RNP who will provide other additional services such as DNA forensics, Ballistics, Forensic Pathology and Digital Forensics. The forensic lab and forensic medicine center were launched by the Minister of Justice, Johnston Busingye, who said that the lab will become an epitome of building a better justice sector for Rwanda and timely delivery of justice and other services. “Government has been spending a lot on forensic evidence. Even if all its services are not starting off today, this lab will fuel scientific based catalysts and research within Rwanda and other countries,” he said. 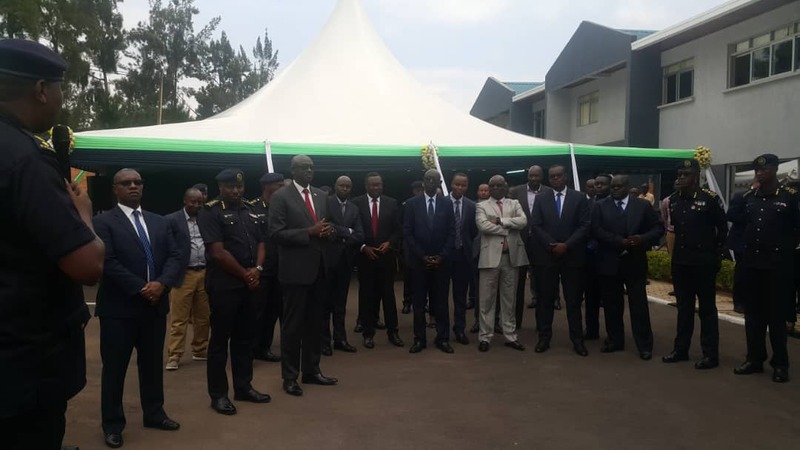 The launch event also acted as a handover ceremony of the laboratory services and operations from the Police to the Rwanda Forensic Laboratory authorities who were legally approved by the law. “In six months we shall start conducting forensic micro biology tests for food poisoning. Other projects also include working with and giving support to drug addicts especially students studying abroad and rehabilitation centers,”he said. The Commissioner General of Police – IGP Emmanuel Gasana, told the press that using scientific evidence will enable Rwanda to combat new and technology based crimes but also provide a stance for development. “We have come a long way to get this laboratory and we hope that we shall attain our transformational agenda since we have a physical base to reach the justice we need,” IGP Gasana said. Prosecutor General, Jean Bosco Mutangana said that the coming of the lab will speed up the timeline of providing DNA sample results as court evidence which normally took three months before the DNA tests returned to Rwanda. By the launch event, 10 tests had already been conducted and the services remained paid for with cash. Mutangana said that DNA cases have been the most cases which need forensic evidence and government has been compelled to spend millions in providing these services.